We loved visiting Arches National Park. We spent 3 days in Moab touring Arches, eating at famous local restaurants, and glamping in an RV. 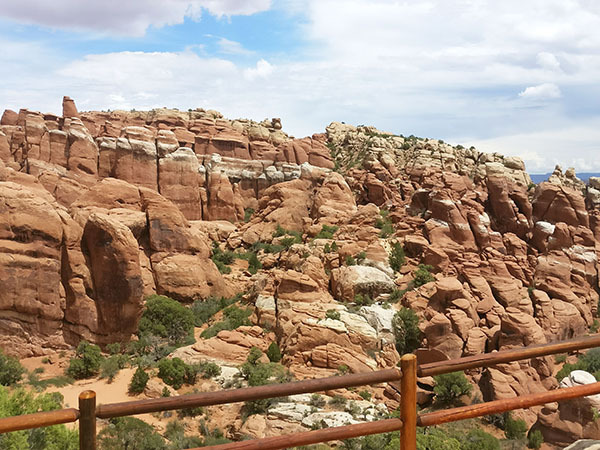 The highlights of day 3 of our family trip to Arches include Panorama Point, Windows, and Fiery Furnace (read about day 1 and day 2 of our Family Trip). This is one of the most beautiful views in the whole park. In the distance you can see radiant mountain peaks, while up close you can peer out onto the vast rocky lands of Arches National Park which from this vantage point resembles Bryce Canyon. The view is so vast you can even see Delicate Arch from here. The time of day you visit will drastically alter what you can see. As the light changes, so do the shadows. Try and time it so that you can catch this view at multiple times throughout the day. This is a great hike for the whole family offering a minimum of three arches to see and touch. A significant part of the path is a low grade staircase which leads to the side by side arches. Completing this short one mile hikes leads you directly underneath the arches and offers fantastic views of several more arches and the desert valley below. This hike offers kids a chance to test their limits in a relatively safe place, steep ridges to feel adventurous and a great example of how Arches was formed. After you finish here, you can cross the road to see and touch two more arches including Turret Arch and Double Arch. From this viewpoint we felt similar to how we felt when viewing the Petrified Dunes. There is a lot of really rich history and geological manifestations at this location, but unless you enter the furnace it’s not going to look like much. If you make your way down to the trails you’ll find a maze of narrow trails suffocated by protruding rocks as you slide and slither and scale your way through this intricate rock jungle. Family Hint: It is recommended to complete this hike with a guided ranger. If you opt to do it by yourself, you must obtain a special hiking permit at the Visitor’s Center (we did not complete this hike on our family trip touring Arches). ► For Kids: Touring Arches National Park is a great way to spend your family vacation. Arches is a historical landmark and geological wonder. Kids will love finding new arches, arches that are hidden behind huge formations or in the shadows, and if they find a new one – they get to name it! Discover Moab offers a complete list of hikes available at Arches National Park. Which one is your favorite? ► Nap-Time Version: A guide for touring Arches National Park including the most famous and well traveled spots you don’t want to miss. Don’t miss day 1 and day 2 of our Family Trip to Arches and our Free 3 Day Itinerary to Arches for getting the most out of your family trip.